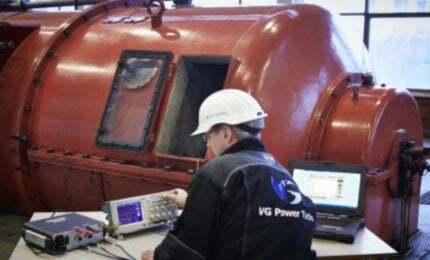 VG Power Turbo specialises in the service and retrofit of air-cooled turbogenerators and auxiliary equipment for the industrial and utility markets. Our workforce has a range of skills, including generator engineering, field service, workshop production, sales and project management. We work with several strategic partners, including global turbine suppliers, and we operate the only independent high-speed rotor-balancing facility in the Nordic countries. We aim to keep your turbogenerators up and running, producing the electricity that you need, while at the same time avoiding the consequences of a breakdown. We call it ‘generating peace of mind’. For more than 130 years generators have been produced in our Swedish hometown of Västerås. This experience, know-how and commitment lives on in VG Power Turbo. We maintain close working relationships with several strategic partners, including global turbine suppliers and sub-suppliers and, as with our sister company Voith Hydro AB, we are part of Voith GmbH, one of the biggest family owned groups in Europe and the world’s leading system supplier for hydropower stations. Voith, which employs more than 40,000 people, continues to enjoy strong growth and profits, and this ensures our long-term operational stability. Your needs will vary, so we start by assessing your generator history and then identify your requirements. From this, we are able to give you the full picture and discuss the way forward. We keep you informed of what is needed, what effect it will have and the cost. This helps us achieve our aim of on-site service with minimum disruption. By matching our skills and experience with your needs, we are able to apply the solutions that keep your generators running and producing electricity.